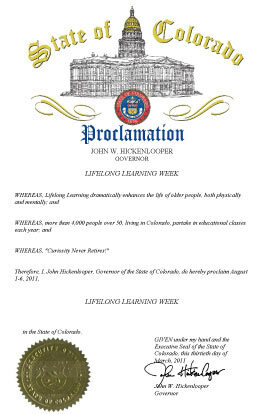 In March of 2011, Governor Hickenlooper proclaimed that the first week of August is "Lifelong Learning Week." The proclamation recognizes that lifelong learning dramatically enhances the life of older people both physically and mentally, and that curiosity never retires. More than 4,000 Coloradans over the age of 50 take educational classes each year. To celebrate, the PILLAR Institute for Lifelong Learning is providing classes throughout the community, including two classes at the FAC. To register for any of these classes, please visit the Pillar website. The Colorado Springs Fine Arts Center turns 75 this year. Join us for a tour and discussion focused on the exhibition Elevated Perspective: Paintings by Joellyn Duesberry with specially trained Fine Arts Center Docents. Joellyn Duesberry is among the most important artists working in Colorado today and is one of the most significant landscape painters in the West. Highlights from the permanent collection range from Hispanic and Indian American art to modern American masterworks. Lunch at Amuze at the FAC is optional. The Great American Songbook: It's De-Lovely! Irving Berlin, George Gershwin, Jerome Kern, Cole Porter, Richard Rogers -- and more!! Join us to celebrate -- to listen, to watch some DVD clips, to sing and definitely to celebrate! You may try to analyze what makes these songs (50-100 years old) endure. You may just want to listen and smile! Wow! Instructor: Marti Booth was chorus master for the Colorado Opera Festival and the recipient of the Pikes Peak Arts Council's 2008 Lifetime Achievement Award.